How good is The Son of Gotham, the penultimate Gotham episode before they go on their winter break? We get really good twists, simply top-notch acting, great story development, some shocking moments, and even a touch of comedy. Gotham, a show not known for humor, snuck in a bit of wry laughs into The Son of Gotham, and even didn't go all-out on the violence that plagues the series at times. All of these combined to make an excellent episode. Jim Gordon (Ben McKenzie) is still haunted by the rookie officer's death at the hands of Flamingo, whom he didn't kill when he had the chance. He hopes that despite all this, the man responsible for the chaos, disgraced Mayor Theo Galavan (James Frain) will go to prison for his crimes. Galavan, however, has a few cards to play. First, he obviously coerces former Mayor Aubrey James (Richard Kind) to perjure himself, with James now claiming it was Oswald Cobblepot (Robin Lord Taylor), not Galavan, who abducted him. This leaves ADA Harvey Dent (Nicholas D'Agosto) stunned and everyone aghast. The judge has no recourse but to let Galavan go. An enraged Gordon cannot tolerate Galavan's smug attitude and fake benevolence, so being Gordon, he punches Galavan in front of everyone. As he's ushered out, Gordon is abducted himself. At a warehouse, Galavan has some fun at Gordon's expense but is too pathetic to finish Gordon off himself, having more important duties to attend. Gordon's life is saved by an unexpected source. This comes after Gordon and his partner, Harvey Bullock (Donal Logue) have been investigating a series of murders that lead them to discover the Sacred Order of St. Dumas, the quasi-Satanic cult Galavan is part of. They eventually enter the sewers where Gordon tricks a brother into revealing the Order's greatest secret: The Son of Gotham shall die and the city shall be cleansed. Gordon rightfully deduces 'the Son of Gotham' is Bruce Wayne (David Mazouz) and that Wayne's life is in danger. Wayne, for his part, appears to have problems of his own. He and Silver St. Cloud (Natalie Alyn Lind) have been kidnapped, apparently to find out what they know. The kidnapper, Tom the Knife (Tommy Flanagan), no relation to Mack, threaten both of them, but Silver stubbornly refuses to say anything about who killed Bruce's parents. Not believing them, they take Bruce to torture the names out of him, and Bruce begs Silver to tell them what she knows. She insists she knows nothing, and Bruce is taken away. Later, Tom comes back to Silver to begin her questioning. She squeals, saying the name was Malone. However, it's at this point that Bruce emerges, alive and well, along with one Selina Kyle (Camren Bicondova). The whole thing was a ruse to discover what Silver knows and whether she could be trusted. Bruce has used subterfuge extremely well, and Silver is unmasked as being part of Uncle Theo's plan to steal Wayne Enterprises from Bruce. Gordon is saved by Penguin, and he is enraged that he is dragged into the Mayor James business. Penguin's fury is overwhelming towards Galavan, and he is going to get his revenge or die trying. In all of this, Alfred (Sean Pertwee) is searching for Bruce, and he encounters Tabitha Galavan (Jessica Lucas). For once, Tabitha cannot take down someone as easily as she has. Alfred proves to be her match in fighting skills, which temporarily stuns her. Alfred manages to flee but Tabitha manages to stab him as he gets into a trash collection truck. With him wounded (but still alive), he is not there when Galavan appears in Wayne Manor. "What do you want?" Bruce asks him. "Why your life, of course," is Galavan's cold answer. The Son of Gotham has to be one of Gotham's crazier hours, full of twists both expected and unexpected. I think we all knew that Silver was set up. At least that was my vague suspicion during the proceedings. However, I think this part was great less for the fact that we figured it was all an act than for the fact that Mazouz got to show just how good he was throughout it. From how he looked genuinely frightened, even terrified over losing at the very least his fingers, to the coldness he has when he lays the smack down on Silver...it was all really brilliant. I think The Son of Gotham is Mazouz's best hour as a young actor, and it is so good to see that Bruce Wayne, who for a time last season was almost forgotten, is if not taking center stage at least a more prominent presence on Gotham. It made me think that we are seeing Bruce's development into Batman. The Son of Gotham, more than any episode as of late, shows how this young man, slightly insecure, hesitant, and in the grips of mourning his parents, is slowly turning into the vigilante Dark Knight. The planning and execution of his plan against Silver, and how he managed to be cold himself to me shows Bruce Wayne is on his way to donning the cape and cowl. It is also really good to see Bruce and Selina working together. Oh, it will be years before Selina becomes Catwoman, Batman's frenemy/lady love, and maybe in time they will know each other's identities (given how they work together, I'd find it hard to believe Bruce wouldn't know Selina was Catwoman and Selina not know Bruce was Batman). However, for the moment Bicondova and Mazouz make a great pairing. In other aspects, the fight between Tabitha and Alfred was one of the most intense I've seen on Gotham. I was amazed at how well Lucas and Pertwee (and I figure, their stunt doubles) moved and jostled throughout this brutal takedown. It is nice to see Tabitha not be as all-powerful as she has been. Logue continues to keep that balance between cynical humor and honest detective work (who'd have figured the sleazy cop would end up being such a good cop), and in the subplot between Edward Nygma (Cory Michael Smith) and Penguin, we get little bits of humor. Nygma appears to be driven crazy by his new roomie, who constantly calls the future Riddler with queries about where certain food is. Nygma's ringtone of Connie Francis' Who's Sorry Now has a bizarre double meaning and is about the only part where you can laugh. 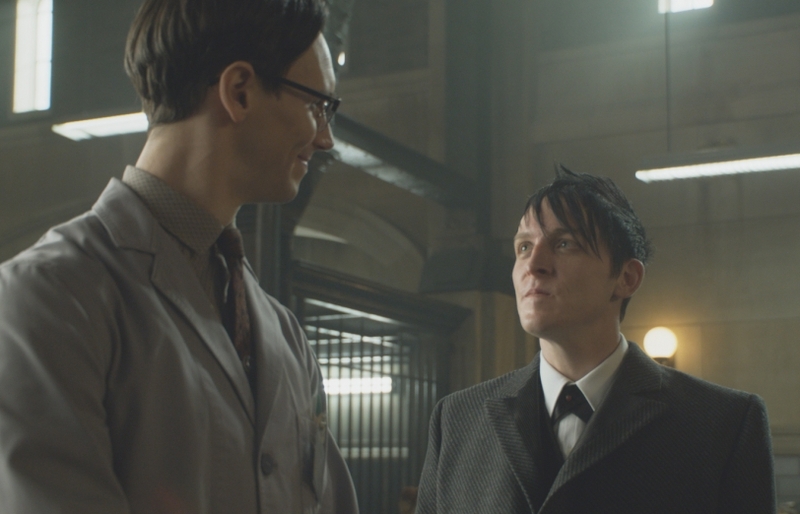 In fact, the whole Odd Couple thing between Nygma and Cobblepot (Nygmobblepot I believe it's called) is slyly hilarious. Everything from Penguin's constant whining to Nygma to Cobblepot's dismissive "Amateurs" when looking over Nygma's collection of 'trophies' was the comic part of the episode. On the whole, The Son of Gotham is leading to what I trust will be an epic conclusion to the first half of Season Two. I think this episode, with its mad monks, crazy fake-outs, and even comic double-acts has brought Gotham leaps and bounds above its good but clunky Season One. No one is sorry now.